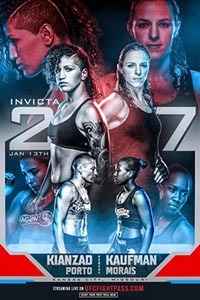 Invicta FC 27: Kianzad vs. Kaufman took place January 13, 2018 at Scottish Rite Temple in Kansas City, Missouri. • Stephanie Alba vs. Ashley Cummins: Ashley Cummins def. Stephanie Alba via unanimous decision (30-27, 30-27, 30-27). • Loma Lookboonmee vs. Melissa Wang: Loma Lookboonmee def. Mellissa Wang via unanimous decision (29-27, 29-27, 29-26). • Helen Peralta vs. Jade Ripley: Helen Peralta def. Jade Ripley via TKO (punches) at 2:21 of Round 1.